Mi Casa owner Luis Perez with his lettuce tacos. Mi Casa is tucked into a corner of downtown, right by the STA Plaza in a spot once occupied by the Greek restaurant Niko's. In a word, this is "traditional" Mexican food. The walls are pleasantly bright yellow, and if you're lucky you might experience Latino-styled dubstep, part of the tunes pumping through the speakers, and something I'd never heard before. Luis Perez owns the restaurant, which opened two weeks ago. He's planning a grand opening in week or two, but wants everyone to know that the doors are open and the burners are ablaze. 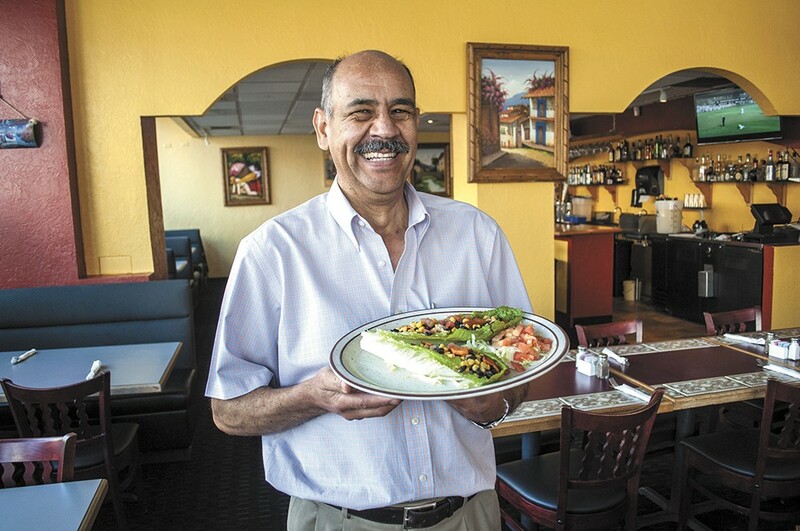 Perez, a 14-year Spokane resident, originally came to the area to help his brother open the Casa de Oro restaurants on Division Street and in Spokane Valley. From Jalisco, Mexico, in a city outside Guadalajara, he left there 40 years ago to find work in the States. The journey found him migrating from California to Seattle, then Oregon and up to Alaska, opening numerous restaurants as a head chef along the way. Recently, he's wanted to branch out from the brotherly partnership, but has kept the family vibe and operates Mi Casa with his immediate family. Perez specializes in authentic dishes like chilaquiles, a soft-taco breakfast dish with eggs and chicken, as well as authentic enchiladas, authentic tostadas and terrific mango salsa made in-house. I ordered the mole chicken enchiladas and the fried, stuffed jalapeños. Though nothing revolutionary, it's aiming at authenticity. And it's exceptionally filling for a good price.